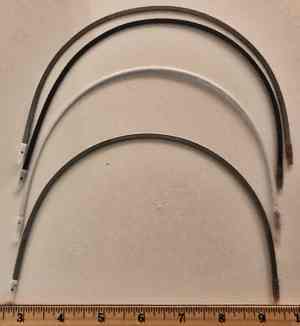 Sew Sassy Fabrics has basic bra underwires from sizes 30B to 56B. We have a Special Buy of several thousand surplus underwires from a major manufacturer. We received 16 new sizes in November 2018. 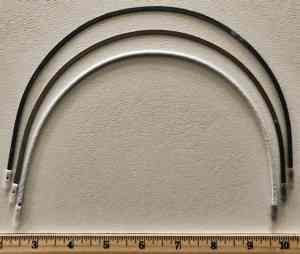 These are flat metal wires with coated tips. Quite a bargain if you can use one of the sizes. Sizes range from approximately 36D to 48B. 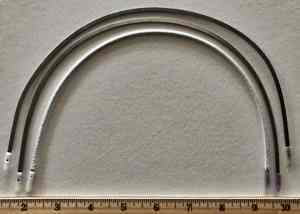 See these underwire images and descriptions. 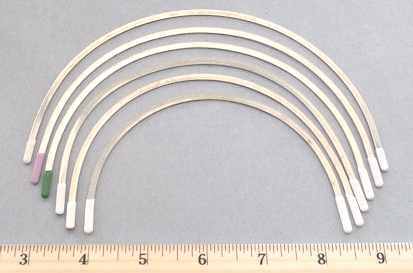 We also have demi underwires. Images and dimensions are provided so the best match can be found for replacement bra underwires. 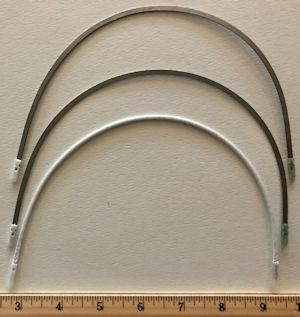 We offer three styles of Underwire channeling (also called underwire casing)for enclosing your underwires. 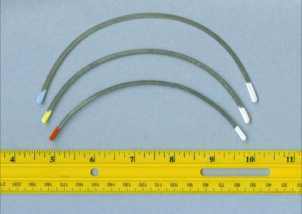 We have 12 different styles and sizes of Separator Wires. Our channeling, separator wires, and most of our bra underwires are offered wholesale. 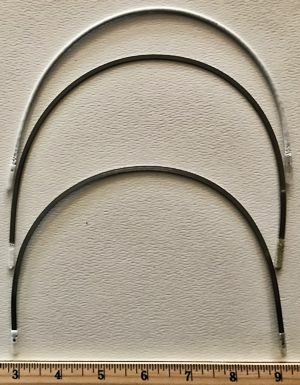 Different women have different underwire requirements, and individuals may want to make different choices for various fashion looks. 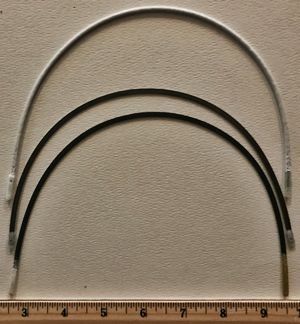 The underwire sizes are suggested bust and cup sizes. 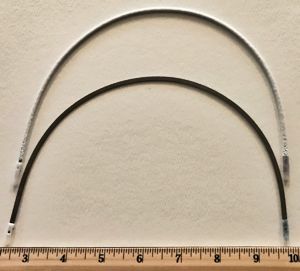 Since the required underwire size will vary according to the garment it is to be used in, it is best to select your underwire by both the length of the wire as well as the size. 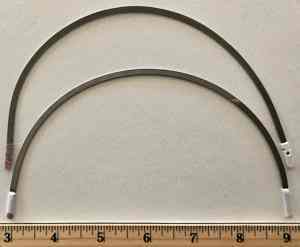 The approximate width, depth and length are given for each underwire. You may want to try adjacent sizes to determine the correct one for your sewing project. 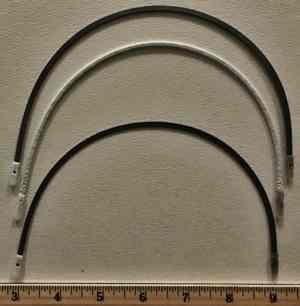 Hint: If you can't get your exact length underwires, get a longer size, cut them off at the tips and cover the ends with epoxy glue. This will keep them from poking through the fabric. 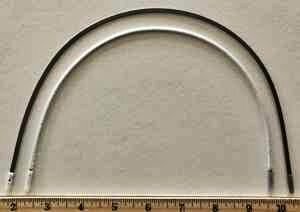 We had a major underwire manufacturer design new underwires for us that are very similar to the UW920 underwires from the previous distributor. They also designed a new size 42. 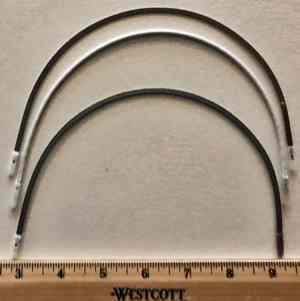 We are the only distributor for this underwire. Flat metal wires with painted color coded tips. These are sized for A or B cups. Use next size for C or D cups. From bottom to top, UW920-32, UW920-34, UW920-36, UW920-38, UW920-40, UW920-42. Enter the number of pair or dozens of pair of each size that you wish to order and then click the "Add to Cart" at the bottom of the table. Order wholesale at Bra Underwires Wholesale. Thin gauge spring steel with a cushiony soft plastic coating and a soft cushion tip. From bottom to top, UW927-12, UW927-14, UW927-16, UW927-18, UW927-20, UW927-22, UW927-24. 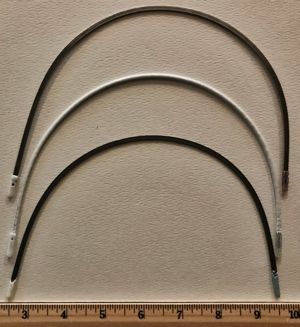 In November 2018, we purchased several thousand additional surplus bra underwires from a major manufacturer. There are 16 new sizes. 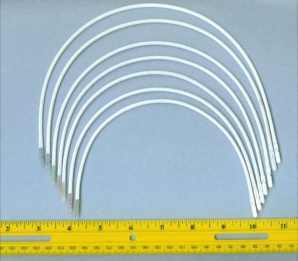 These are flat metal wires with coated tips. Quite a bargain if you can use one of the sizes. Sizes range from approximately 38B to 56B. Images and dimensions are provided so the best match can be found for replacement bra underwires. From bottom to top, UW920-34, UW68. From bottom to top, UW920-40, UW69. From bottom to top, UW70, UW927-14, UW71. From bottom to top, UW920-42, UW71, UW72. From bottom to top, UW46, UW47, UW927-16. Save 25%. $31.50 for a package of 6 dozen pair. Select the number of packages of 6 dozen pair. From bottom to top, UW35, UW927-16, UW2. From bottom to top, UW927-16,UW74, UW19. From bottom to top, UW17, UW927-18, UW75, UW22. From bottom to top, UW76, UW59, UW927-20. From bottom to top, UW77, UW927-20,UW58. From bottom to top, UW78, UW927-22. From bottom to top, UW927-22, UW79, UW80. From bottom to top, UW927-24, UW81, UW82. From bottom to top, UW927-24, UW83. Flat metal wires with painted color coded tips. From bottom to top, UW923-S, UW923-M, UW923-L.